Build a rat rod truck or a hot rod truck cheaper and easier than you thought possible with plans from the master of beer budget hot rods, Chester Greenhalgh. Chester shows you how to do it ALL for the least amount of money invested; yet what you get is safer, more reliable and way better performing. To something like this reliable performance, daily driver rat rod truck or hot rod truck … for way under $3000! The author of this new rat rod truck beer-budget building bible, Chester Greenhalgh, developed a cult following in the hot rod world in the 1980s when he released the now legendary “How to Build a T-Bucket Roadster for Under $3000”. When it went out of print, people gladly paid over $200 for a copy on eBay and Amazon — and then we worked with Chester to introduce the new digital edition for less than $20! 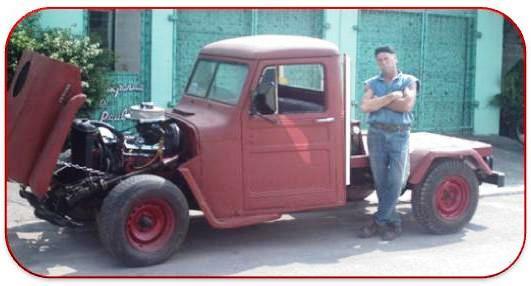 His new eBook on budget building a rat rod truck or hot rod truck is destined to be his next legendary contribution to the rod building world. Today, undoubtedly the least expensive and simplest way to go hot rodding is by mating a classic pickup truck body to a modern chassis and V8 engine. 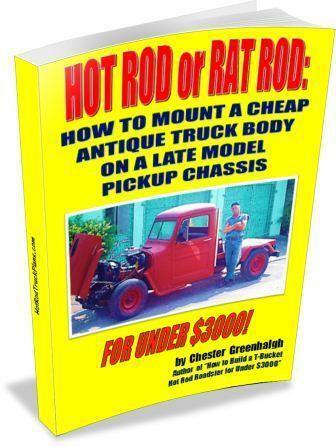 That’s exactly what Chester shows you step-by-detailed-step in his new eBook, “Hot Rod or Rat Rod Truck: How to Mount a Cheap Antique Truck Body on a Late Model Pickup Chassis for Under $3000“. Chester Greenhalgh has spent half a century building hot rods, for himself, friends and customers: all on a working man’s budget, using plain old everyday tools and a ton of creativity. Getting the most performance, pleasure and attention for the least amount of money is the principal that has guided Chester all his hot rod building life. Don’t believe it? Take a look at Chester’s first rat rod truck: a 1922 Dodge bucket and pickup box on a Model A frame with 1940 Ford flathead V8 and running gear that he and his brothers built in the 50s. That’s the background. Now, here’s what you’ll get to put you firmly on the low-buck hot rod and rat rod truck road. 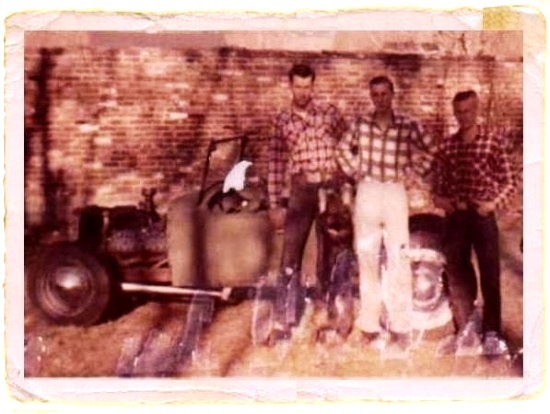 Preface: How Chester’s hot rod roots influenced this eBook and what you can expect if you build a hot rod or rat rod truck following the plans in this eBook. Prepping the Frame: How to trim off excess frame mounts, relocate the fuel tank and drop the chassis 5″ (the cheap and easy way) for that cool, low rat rod truck look. Plus, an easy way to mount pro-street wide tires without narrowing the rear end. Mounting the Body: How to center the antique body on the modern frame and how to channel the body to make that hot rod or rat rod truck even lower. Like we said, this new hot rod and rat rod truck plan eBook by Chester Greenhalgh is destined to become legendary, just as his “How to Build a T-Bucket Roadster for Under $3000” did. “Hot Rod or Rat Rod Truck: How to Mount a Cheap Antique Truck Body on a Late Model Pickup Chassis for Under $3000“ is a 107-page eBook featuring over 200 full color photographs and illustrations covering every facet of this easy-to-build, low-buck approach to hot rodding. And, it’s yours for only $12.99! Just click the Download Now button and be ready to download your own personal copy immediately.